We just discovered the problem that there's no conexion existent between the excel generated in Jotform. We've been making trials, filling the form and that info does not appear on the excel in the moment. But neither the next day. Is weird, because it normally works, So I don't know what is the problem with that Form. Only If I remove the excel and generate another new, it works, but is momentary because if someone new is registered, it does not appear. I presume when you say "Excel Sheets" you are actually referring to the Google Spreadsheet Integration? I went ahead and pushed the missing submissions, could you please check again? May we know if you are making changes on the spreadsheet? Like changing the sheet name, title, adding columns, changing column names, adding new rows, etc...? Please note that if you make extensive changes on the spreadsheet, it may cause the integration to break, which stops the spreadsheet to update. Could you please try the following. 1. First, remove the integration. 2. Let the form builder save the changes. 3. 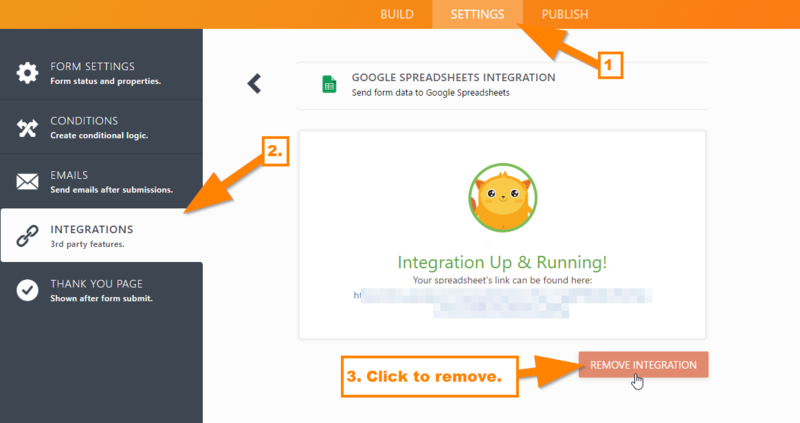 Open the Integrations page again and connect Google Spreadsheet. This will create a new spreadsheet. 4. Existing submissions in your form will automatically be inserted in the spreadsheet. 5. Test your form by filling it out and hitting the submit button. See if the submission will go through the spreadsheet. If it still fails, please send us the spreadsheet link wherein we can access it. Here's a guide link on how you can share a Google file to us: https://support.google.com/drive/answer/2494822?co=GENIE.Platform%3DDesktop&hl=en.